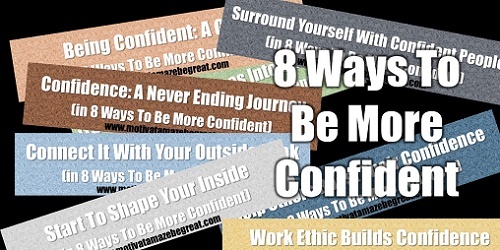 8 Ways To Be More Confident In Yourself - Motivate Amaze Be GREAT: The Motivation and Inspiration for Self-Improvement you need! One of the major determinant factors of someone's ability to succeed in life it's their level of confidence. To achieve something you have to be certain about your skills. You got to have a deep conviction that a positive outcome is possible from the actions you take. Most people fail in life because they don't believe in what they do. Are you self-assured? Do you fully trust in you? Maybe, you care too much about what other people think...maybe, you don't believe you are worthy of having it...maybe, a bad experience from the past aunts you and takes the faith in your capabilities away. How can you become more confident in yourself? To be confident you need to feel good about yourself. It all starts with your physical body. Eat well, exercise, meditate. Engage yourself in positive actions to create the inner chemistry necessary to spark good feelings inside you. Work on your mind. Think positive, act positive. Stimulate your brain by reading and writing. Listen to audio books or inspirational music. It's doesn't matter if you think good but look bad. Work on the simplest aspects of your daily hygiene. Dress right for each occasion, but also, in a way you feel comfortable about yourself. Work on your posture, put yourself in strong and powerful positions. Smile often and approach people in a polite and confident way (even if you don't feel like it, "fake it 'till you make it"...): strong presence, firm handshake, good eye contact. People respect this simple mannerisms, and the best part is that they respect from others will make you better and more confident with time. Like anything you want to accomplish in life, you got to have a strong desire to be confident. Not a wish, but a strong desire! The best way to do this is to see self-confidence has a goal you want to achieve, correction, something you must achieve. Treat it like any other goal: write it down, track your progress, review it everyday, connect it with the benefits that achieving this goal will bring to your life. Drive yourself to be confident by making it a target. Things will work if you work on them. By being diligent with your daily actions you become better and better, self-assurance and confidence grows. That's exactly what a good work ethic is all about! Grow yourself into the person you want to become by taking consistent action. Don't skip it! Do your tasks daily, even if it's just a small amount of tasks, that may look pointless alone, they will make a huge difference if you manage to be consistent for a good period of time. But to achieve big with small, it's mandatory that you do your small tasks daily. Take time to analyze yourself: what things do you fear? What things prevent you from being the best version you can possibly be? Acknowledge the areas you have to improve in life. Write down your major qualities. Design a custom made improvement plan where you name your weaknesses and strengths, improve your weaknesses with the help of your strengths, be clever about it. No matter how strong people are there is always someone who can bring them down. Sound familiar? Who you associate yourself with is who you become. Get way from people who think poorly, get away from people who are constantly bringing you down. Connect with those who support you and encourage you. Inspired people will inspire people. Let strong people push your confidence up. Working on yourself will make you strong, but when you help others you advance into the next level, you become stronger. Simple and easy acts of kindness can make a great difference to others, and will make wonders to you if you take the time to do them. Saying thank you, giving compliments, advising people, helping them with great tips, it all counts! Anytime you give an advice to someone, you're giving that advice to yourself back, imagine if you repeat this process daily? How much confidence and growth can you get? Huge! Hope you've enjoyed this article and now you can begin to be more Confident in Yourself. Do you know someone who needs a confidence boost? Share this article with them and your friends using the sharing buttons on the side or bellow.